About Us - Meteorites For Sale.com - The Meteorite Exchange, Inc.
Jim and Paul met during an astronomy club meeting back in the late 80's. Besides astronomical observing, they started tinkering with the idea of starting a meteorite based BBS (this was just before the Internet really got going). As they they saw the enormous advantages of the Internet all thoughts going the BBS route were immediately shelved. In early 1996 the domain name meteorite.com was acquired and the business, The Meteorite Exchange, Inc. was registered as a corporation in 1997. As the popularity of The Meteorite Exchange, Inc. grew, Jim and Paul decided to keep meteorite.com open for other Meteorite Dealers to advertise their businesses on the site as well as Jim and Paul having their own Meteorite For Sale Catalog. When Voyage Magazine stopped publication, Jim and Paul decided to start an online meteorite magazine called Meteorite Times Magazine, The focus would be for a fun read with the purpose of promoting the meteorite community. 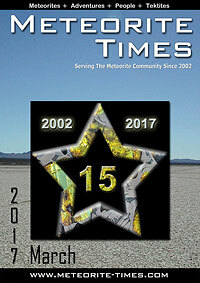 The first online issue of Meteorite Times Magazine was published on April 2002 and celebrated 15 years of publication in 2017. In 2007 Paul and Jim made the decision to move their for sale catalog from meteorite.com to a professional eCommerce site with the domain name meteorites-for-sale.com which began operation on June of 2007. Technology continues to advance and a major effort is continually invested in the site to keep up with security requirements and providing an unparalleled user experience. 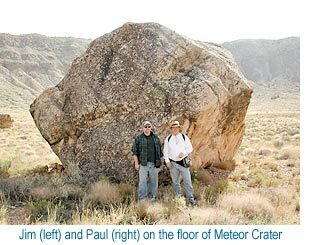 As life-long enthusiasts in the field of meteorites, Jim and Paul have handled thousands of meteorites of all types and can recognize them from other rocks. This goes hand in hand with our many years of hunting and finding meteorites. They have picked up hundreds if not thousands of meteor-wrongs of all types and have learned what is not a meteorite also. But such experience and knowledge are always of secondary importance to having good scientific and historical information about specimens. The basic question is it a meteorite, can be answered for many stones by simply looking at the specimen. For example, a slice of an iron meteorite that is polished and etched and exhibits a Widmanstatten pattern is unquestionably a meteorite. There is no man-made process to create the pattern which formed over eons of slow cooling in space. A similar situation applies to Pallasites. The mixture of nickel-iron and olivine crystals is unique and easily recognizable. The presence of chondrules and grains of nickel-iron in the chondrite family again make these meteorites visibly different from terrestrial rocks. Some meteorites such as Lunars and Martians have much in common with rocks from the Earth. These absolutely require laboratory analysis to determine if they are meteorites and their place of origin. This brings the next source for confidence that a stone is from outer space if it is in our catalog. All stones that are listed as classified meteorites have been examined and tested in laboratories by professional meteorite scientists. That official listing is available online at The Meteoritical Database. It is one thing to know that it is a stone of a certain type of meteorite and a different matter to be confident that it is the exact find or fall of meteorite a dealer is selling it as. We only purchase meteorites that have a chain of provenance through reputable dealers. We do not buy questionable stones or sell meteorites that have been handled previously in a careless manner. We deal only with dealers that share our high standards of stock management and inventory control. Since many meteorites look similar it is important that during all handling, and especially during cutting and preparation that the slices, fragments, and individuals are not mixed or incorrectly labeled. We take great care to keep specimens together and prevent mixing. Some of the meteorites in our catalog are stones that we have had classified ourselves. We have sent samples to meteorite laboratories and waited until the meteorites are officially accepted by the professional meteorite community before listing them for sale. We do not sell meteorites prior to their becoming official without clearing stating in the listing that they are unclassified meteorites. Unclassified meteorites are always stones that are clearly meteorites. Metal grains, chondrules, fusion crust, or other uniquely meteoritic features will be easily recognizable in unclassified stones we sell. Historic meteorites which fell in the distant past or meteorites famous for their scientific value are another group where it is important to know that they are the meteorite they are supposed to be. We make every effort to only buy such higher value stones from collections, museums, and dealers that have well-documented chains of custody. In the last 20 years, some meteorites have been recovered and tested multiple times by multiple laboratories. They have been assigned several different names or numeric designations. It has been a practice of some to look at stones and sell them with one of these numbers or names without having further testing done. In many cases, this is a safe practice as some of the meteorites are quite unique in appearance. We do not engage in this practice of visual pairing of stones regardless of how tempting and safe it may or may not be. Meteorites are rare and unique objects that deserve special handling and care. It is appropriate for customers to ask questions and to seek assurance about their authenticity. We are always happy to answer questions and provide certificates of authenticity when requested.